Earlier this month, Sports Illustrated published the results of a player poll in which Gary Matthews Jr. was voted among the most overrated players in the league. I’m not sure whether this was the same poll that voted Joey Votto the MVP for the first half of the season, but at least this Gary Matthews Jr thing the Reds agreed with. They had given the guy a minor league contract with an opt-out provision for him if he wasn’t called up by Saturday. But whom would they have taken off the active roster for him? Jonny Gomes ain’t goin’ nowhere. Jay Bruce, Laynce Nix, and Chris Heisey have made themselves welcome characters on the Cincinnati stage. Even Drew Stubbs–who hasn’t exactly been outperforming Mr. Matthews so far–has enough potential in the possibility he’ll learn to lay down a bunt for a base hit to hold onto his roster spot over the overrated Matthews. So, as of Saturday, Matthews opted out of the contract with the Reds organization and is now available to be hired by a team near you. Surely someone needs an outfielder. The Yankees are always hiring overrated players; maybe they’ll be able to hook up. Posted in Cincinnati Reds, Wheeling and Dealing. 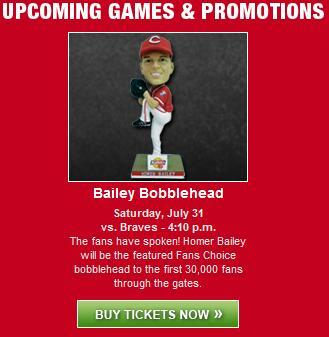 The first 30,000 people through the gates this Saturday, July 31 to see the Reds take on the Atlanta Braves will take home this lovely Homer Bailey bobblehead, or, at least, will have the opportunity to sell it to some guy with a big bag who wanders around offering up $10 or something. In case you haven’t been watching the television broadcast for the last two weeks to hear them say it 30,000 times, the game start time has been changed. Even if you have your tickets in hand and see a different time on them, know that this game starts at 4:10 p.m. If you want to be among the first 30,000, you’ll want to be heading over there shortly after lunch. Posted in Cincinnati Reds, Homer Bailey, Press Releases.